Original 1991 24 Hours of Le Mans Poster. June 22 & 23, 1991. The 1991 Le Mans poster is part of the "The star car used for sponsorship" era in Le Mans posters which lasted from 1981 to 1997. 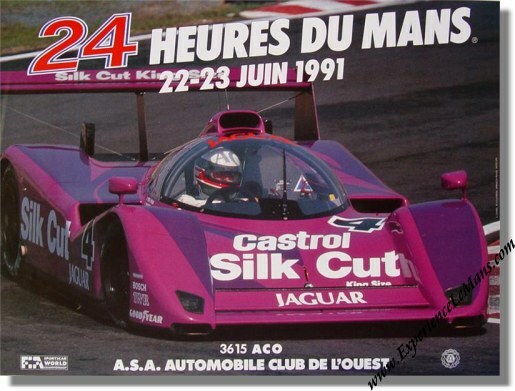 Design of the 1991 Le Mans poster was again in the hands of the S. Conseil agency and is based on a color photograph of the Nr 4 Jaguar XJR-14 that grabbed pole position but was later withdrawn before the race. The 1990 poster did not innovate in terms of graphics. The race was won by Volker Weidler, Johnny Herbert & Bertrand Gachot in their # 55 Mazda 787 B with a total of 362 laps to their name. For the full results of this race, please see 24 Heures du Mans results 1991.